Purples on trellised Field Shield Bisected Bend Sinister Upper Poignard Fitchee Mantled Entwined by Vine Lower Deux Croix Surmounted by Roundel with II Upper and I Lower on Hatched Field Adorned by Scroll with Motto NIL MORTIFI SINE LUCRE within Flourished Frame with Mantle Based POSTAGE PAID White on Dark Purple in Rectangular Frame. 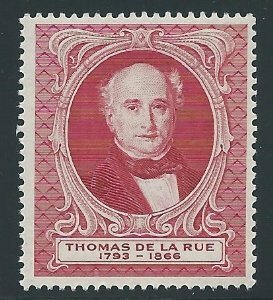 Commemorative stamp printed in 1966 by the De La Rue printing company to celebrate the centenary of the founder’s death. Notes: Also known as the Zombie stamp. Reverse features a yellow backing carving a red skull and crossbones. The orientation of the Skull varied and are designated by their orientation - 3 o’clock, 6 o’clock and 9 o’clock and 12 o’clock. There were 30 sheets 28 stamps to a sheet making 840. 1 in 40 LBEs. The early stamps were in a self-seal plastic bag but it was possible to detect the presence of the stamp in the LBE. Subsequent stamps were put in ordinary plastic bags. Differences: Tail of the vine around the dagger is missing and back is plain white. Originally found in some Hogswatch FDCs. Notes: 40 produced, of which 10 escaped in Hogswatch FDCs. Differences: The front of the stamp is the common image with the tail of the vine on the sword however the reverse is blank and not the yellow with red skull and dots.